View More In Pasta & Pizza Tools - Page 5. 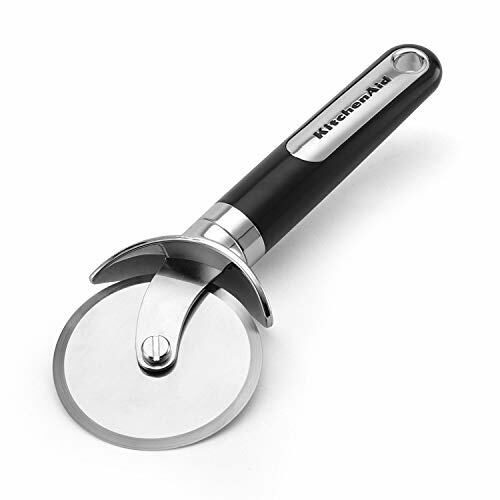 Cut your pizza in safety and comfort with the KitchenAid Pizza Wheel. The pizza wheel is individually packaged, and comes in a variety of colors. The wheel features a sturdy, stainless steel cutting blade which slices through the thickest pizza crust with ease, and an angled wheel that offers optimal comfort and performance. The built in finger and thumb guard provides additional safety. An ergonomic handle provides a comfortable grip. The pizza wheel is dishwasher safe for quick and easy cleanup. SLICE PIZZA LIKE A PRO: Pizza restaurants use a roller cutter like this one; the sharp blade makes a clean cut in any crust and, unlike using a knife, actually presses the crust and toppings together, keeping the toppings on your pizza. COMFORTABLE HANDLE: The angled wheel allows optimal comfort and performance while cutting hot pizza right out of the oven; the built-in finger guard and ergonomic handle design protects your hands from the heat. DISHWASHER SAFE: No more worries about how to clean stuck food from your pizza cutter, simply place it in the dishwasher for a thorough full cleanup! LIFETIME LIMITED WARRANTY INCLUDED: These pizza wheel comes with a 1-year hassle-free replacement and Lifetime Limited Warranty.